Spring is fast approaching and with the warmer weather comes the promise of a visually stunning show of trees. Dogwood trees in particular are one of spring’s early bloomers providing an abundance of colorful blossoms. Dogwoods thrive particularly well in the south and can be found across the State of Georgia. 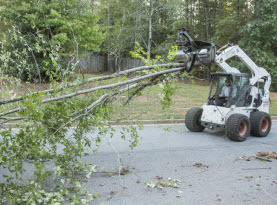 The skilled professionals at Milam’s Tree Service have the expertise and experience to help you care for the trees around your Greater McDonough home or commercial property by providing professional tree trimming and pruning services to ensure that your trees look their best all year round. Dogwood trees are compact in size with large blooms that come in a variety of different colors including pink, red and white. The branches weave as they grow and are often described as curvy in appearance. Dogwoods thrive best in partial shade, although they can tolerate full sun. They can often be found growing in the wild in shaded areas of hardwood forests. Dogwoods are highly adaptive and can grow in a variety of different soil types including soil that is sandy or rich in clay, although they will benefit more from soil that is slightly acidic in nature. If your soil is lacking in acidity, you can remedy this at home by adding organic matter to the soil. Soil should be moist but not overly saturated. While dogwoods are considered to be drought tolerant, they do need water during extreme periods of drought or prolonged heat. To ensure that your dogwood trees remain healthy, begin by checking the soil around the trees to ensure that it has not become dried out. By paying attention to the weather, you will have a general idea regarding the amount of precipitation that your trees are receiving. Spread a three inch layer of mulch around the base of each tree to make sure that the soil is retaining enough moisture. 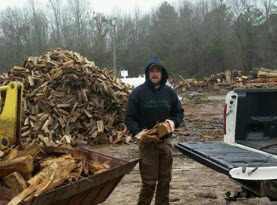 Mulch serves a dual purpose, it will also add in the prevention of grass and weeds growing around the base of the tree which could potentially be robbing your soil of valuable nutrients. In most cases your Dogwoods will not require fertilizer unless your soil is of poor quality. To establish the quality of your soil, you can perform a soil test which can be purchased at your local nursery. If you do need to fertilize your trees, the optimal time to do so is early spring and early fall. Contact your Milam’s Tree Service professional in early spring to prune your dogwoods while they are still dormant. Professional pruning will ensure that your dogwoods are healthy and thriving. 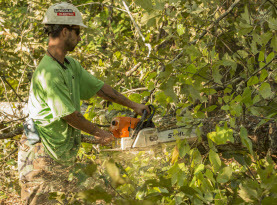 Your Milam’s tree pruning technician will remove dead and damaged branches along with thinning out the center of your trees to allow for adequate air circulation to prevent the growth of mold, fungi and mildew from damaging your tree. Dogwood trees are easy to grow in a multitude of different climates and the large bright blooms are visually appealing and make a great focal point within any landscape. The dogwood features beautiful deep green leaves during the summer months, while during fall they are well known for their textured grey trunks that can be seen once their leaves being to drop. Honor the Southern tradition of the elegant dogwood and provide your property with year round color and complexity. 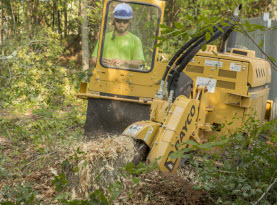 If you are interested in learning more about Tree Pruning & Trimming, Emergency Tree Removal, Stump Grinding and Removal, and much more, for your Henry, Clayton and Fayette Counties Home or Business, contact the knowledgeable experts at Milam’s Tree Service today.